After a the summer vacation, the school commenced on May 16, 2016 for the teaching staff. There was a get together for the staff wherein the new joinees were introduced. Some of our staff had been to ITALY – ROME to visit the international members of the Congregation, Adorers of the Precious Blood of Christ. They shared their experience about the trip. All teachers were allotted their responsibilities. The class teachers started the planning to decorate their classrooms to extend a warm welcome to kids. To energies, and motivate the staff, the management had arranged various seminars. A traning session on 0365, an initiative by Microsoft was given by Ms.Seena on May 17, 2016. The topic of the session was about Collect, Collaborate, Create and Communicate. She imparted information on windows, bing, sway, one note, office 365, Skype, Yammer, and one drive. It was an interesting and interactive session. Practicals were done in computer lab. Seminar was guided by Prof. Roopeshon May 18, 2016. The session was about Positive outlook, Team spirit and bonding, Role of teachers in the society. There was an interesting and extended form of our childhood story “The Tortoise and the rabbit” giving the message of team work. 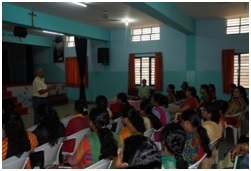 Dr. ApoorvaPallam Reddy rendered a talk about women health from Mathrutva fertility center. She threw light on the different physical and mental changes which women undergo. It was followed by Ms. Aswini from Ontoez who entertained teachers by conducting activities like games, movie quiz, commercial advertisement quiz and one minute games. It was full of fun and laughter. On May 19 a session on Wellness by Mr. Mathew from Herbalife was conducted. His session was very humorous about food habits. He introduced Herbalife products for better nutrition. Math workshop was conducted by Mr. Shastri on May 20, 2016 for all Maths teachers. The session was about Math communication. The workshop had topics like expression of numbers, place value, magic square and kirigamy. 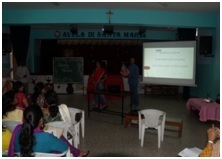 An educative session by our Special Educators, Mrs. Irene and Mrs.Rochel for I to IV teachers was conducted. They made the teachers aware of the strategies adapted by them to help student with learning difficulties. 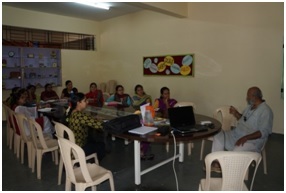 On 24 May a session was conducted by Mrs. SujathaRao for kids’ world teachers. On 26th May Fr. Devadas took a seminar about Relationship building and Positive attitude. The seminar was supported by PPT. He gave many real life examples from his counseling carrier. He gave tips to enhance the relationship between husband and wife. Induction Program for the new staff was conducted on May 27, 2016. The objective was to throw light on the history, vision and mission of the Institution. She also threw light on the dos and the dont’s and the reasons behind it. She stressed that we need to work towards value based education to be imparted to the students with academics. She also included some motivational notes from Robin Sharma’s book. Any person needs to have knowledge on how to manage his/her finances. 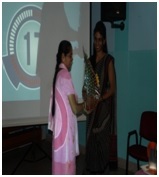 Hence a session on Financial Planning was given by Mrs. Rajane Prasad for the teachers. She came up with the new concept of Expediture = Income-savings. She also suggested different ways of investments.